Strawberry Pineapple shrub is an easy preserve that is a perfect cocktail mixer and it elevates sparkling water infinitely. The vinegar and sugar combined with the fruit make a bright and flavorful syrup with very little effort and this is the perfect shrub for beginners because it is simple to make. I enjoy mine with sparkling water (the lemon flavored kind is a tasty addition) and with a shot of tequila. It’s not as foreign a flavor as my delicious Rhubarb Pineapple Balsamic Shrub so I’d say it’s the better of the two to start with if you are shrub-uninitiated. This particular shrub also is the prettiest pink color. Read on, Dear Readers! Chop the fruit and place in the bottom of a large jar. You can fit it all in a quart jar, but I prefer to use my half-gallon and have plenty of room in case my fruit isn’t chopped small enough to fit nicely in a quart. Add sugar to the fruit and toss in a jar to coat. Add lid and leave for 24 hours. Chopped pineapple and strawberries awaiting sugar. Shake and then add the vinegar. Screw the lid on tight and leave on the countertop for about a week, shaking or stirring daily. Here’s my casual Periscope broadcast of me straining shrubs to show you what the nearly finished product looks like. The shrub is now ready for mixing! 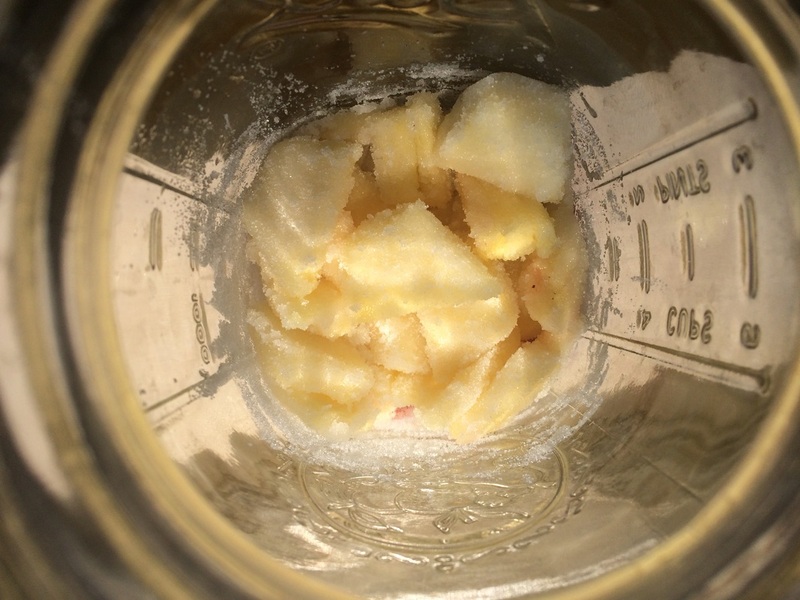 Store in the refrigerator until mixing in the following ways. Or as a refreshing addition to sparkling or plain ice water, add 1 to 3 tablespoons shrub. The basic formula for a shrub is 2 cups chopped fruit + 1 ½ cups sugar + 1 ½ cups vinegar if you want to experiment. I can’t wait to hear what combinations you come up with, Wildflowers! Please share in the comments below what you create and be sure to print your free recipe card! I started making shrubs as one way I could have something tasty and pretty to serve for company. They are sweet, but not too sweet, and jewel-colored, which is obviously fun, and different than everything else I could buy in a store. They are a way that I can (hope) to make my guests feel welcome and special, instead of letting on that I really feel like a colossal hot mess most of the time. They are fun to whip up, easy to make and make me feel like I am able to really demonstrate my desire to be a kind hostess. I think learning a skill like homemade cocktail mixers like shrubs helps you be a genuinely better host to your loved ones. Here’s a pretty graphic that will hopefully help YOU know what the heck to gift next time you are the one being hosted, Wildflowers! 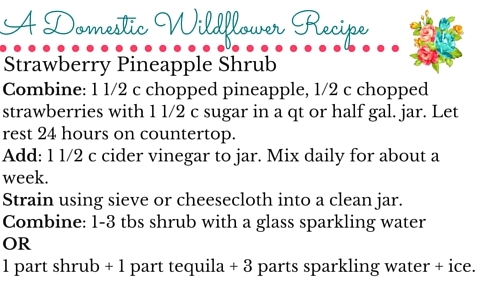 If you want to learn even more about making shrubs, I created a free email course just for you! Sign up for all my shrub recipes and the ratios to make nearly any fruit into a sweet-tart syrup! If you love strawberries, you’ll love my Canning Strawberries Recipe Book! Please share your thoughts and comments in the section below, Wildflowers! I love hearing from you! New Book Coming Soon: Love Into Jars! Follow me here, there, & everywhere! This video course will invite you into my kitchen to watch me can a wide variety of recipes and use several beginner friendly techniques. It is the perfect course if you want to learn but have no idea where to start; even if you've never boiled a pot of water! Learn how you will know you are doing it right, safety best practices, simple recipes that are foolproof and guaranteed to impress, and skills to apply to any recipe. Make easy, no-cook fruit & vinegar syrups for cocktails & mocktails! This ebook shares crowd pleasing recipes and simple to understand ratios so you can make a shrub on your countertop any time- without a recipe. Dive into these Prohibition Era drinks today! All content created by Jennifer Gomes unless otherwise noted.